Restaurant Iris's Midnight Snack is awesome, but the kitchen closes way before the best time to eat it. Local food blogger Justin Fox Burks created a vegetarian version of the Midnight Snack for his new cookbook, "Southern Vegetarian: 100 Down-Home Recipes for the Modern Table", which he co-authored with his wife, Amy. The recipes are meat-free versions of Southern classics that the couple has developed over years of cooking and blogging for the Chubby Vegetarian. Justin and Amy gave me their permission to publish the recipe for the Midnight Snack so that you don't have to wait until the book comes out to get your eat on. 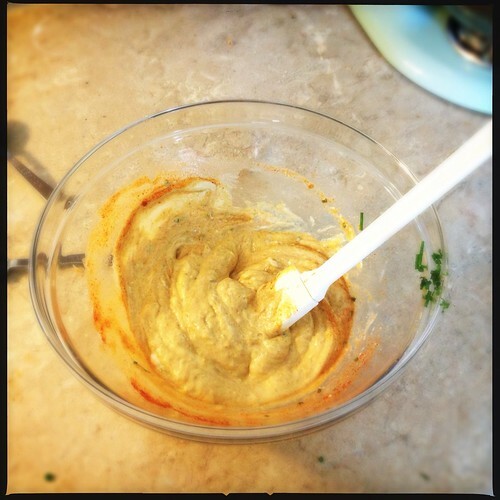 In a large bowl mix the mayonnaise, mustard, lemon juice, vinegar, celery salt, sugar, paprika, onion powder, granulated garlic, horseradish, and chives together until well incorporated. Keep in a food storage container in the refrigerator. Now, for the fun part: the Midnight Snack. What I loved about making this is that you make all of it in one pot, which means it's super easy to make when it's late and you might not be, you know, at your best. In a large pan over medium heat, bring an inch and a half of water to a simmer. Add the salt and vinegar to the water and return it to a simmer. Poach 4 eggs at a time by slowly cracking the egg into the simmering water and allowing it to cook for 4 to 5 minutes or until the white is set. 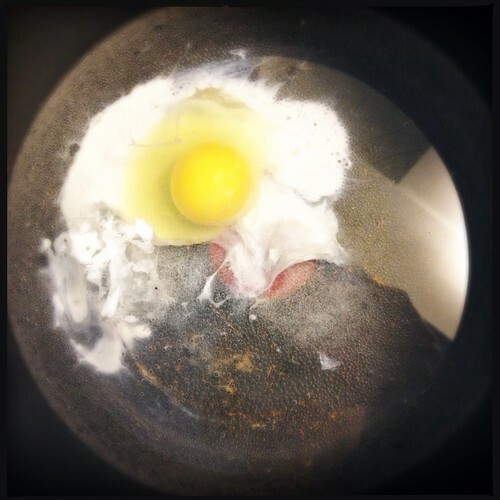 Remove egg from the water and set aside on a paper towel until ready to serve. Discard cooking water. Spread butter onto the slices of brioche. Using the same pan as you did for the eggs, toast the slices of brioche over medium heat just as you would a grilled cheese. Once the bread has achieved a light brown color, remove it from the pan and set aside. Again using the same pan, crank the heat up to high. Add half the canola oil to the pan. 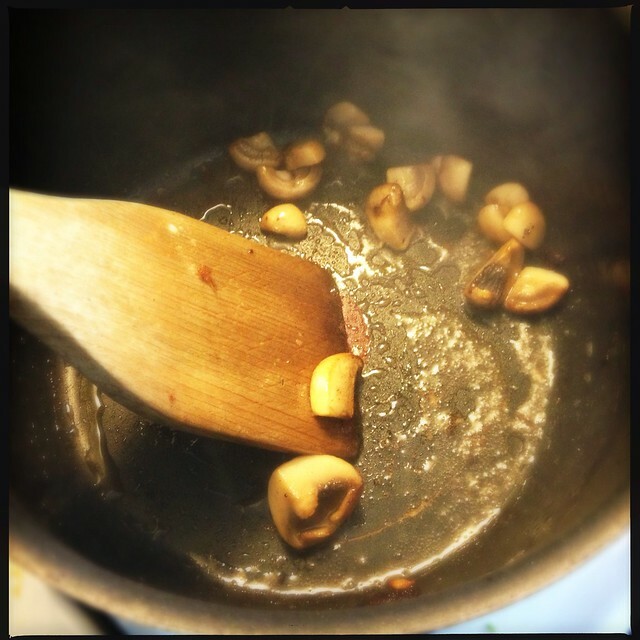 Once the oil starts smoking, add the mushrooms and cook for 3 minutes. Remove them from the pan and set aside. Add the remaining canola oil to the pan along with the artichoke hearts. Cook for 3 minutes or until the edges turn golden brown. Turn the heat off. Add the mushrooms back to the pan along with Chef Kelly English's Remoulade Sauce. Toss to coat. Divide the mushrooms and artichoke mixture among the toasted brioche slices, top with a poached egg, and garnish with fresh dill, cracked black pepper, and Maldon sea salt to taste. "Southern Vegetarian: 100 Down-Home Recipes for the Modern Table" comes out next week, and to celebrate, Justin and Amy are having a party at Central Barbecue downtown on Tuesday, May 14th from 4 p.m. – 6 p.m. The book will be available locally at Whole Foods and Booksellers at Laurelwood. Ed. Note: This recipe originally appeared on The Chubby Vegetarian. It's been republished here with their permission. Don't think it was advertised as "vegan" – unless I missed something. Vegetarian but not vegan. Yeah – I misspoke. It’s corrected now.